Tensions with Russia, Islamic extremists and a security environment hinged on US-China relations are just some of the strategic challenges this week’s election winners must face, according to the Royal United Services Institute (RUSI). The Institute, which enjoys close historical ties to the British establishment, has outlined the complex challenges and choices in store for whichever party – or combination of parties – find themselves in power after Thursday’s election. It has been published ahead of two important reviews which will take place this year: the National Security Strategy (NSS) and the Strategic Defence and Security review (SDSR). The paper concedes in remarkably frank language that many recent military actions can rightly be viewed as strategic failures, which, far from advancing global aims, have hindered them. Chalmers also posit that the epoch of regime change followed by large-scale programs of “personnel-intensive” social engineering, such as those wrought on Iraq and Afghanistan, has passed. The paper also takes stock of new and emerging threats. Critically, it does so in light of past interventions in both the Middle East and Europe. Yet Chalmers’ views run counter to the rafts of potential doomsday scenarios touted by some senior political figures with regards to Britain’s current international opponents. 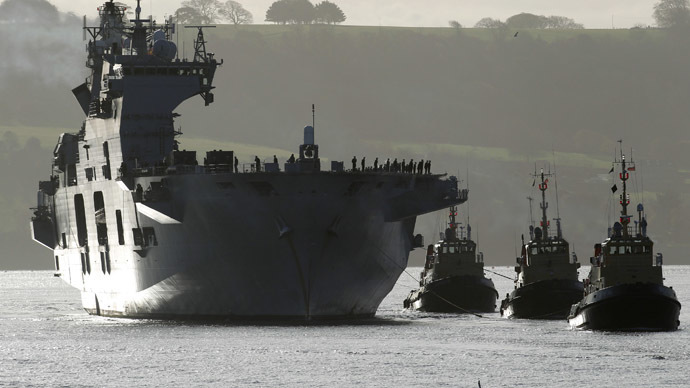 The paper also suggests Britain’s much-hyped aircraft carrier program, which aims to put the first vessel in service by 2018, may absorb rather than increase UK resources and capability. The debate on Britain’s ability or need to contribute a symbolic 2 percent of gross domestic product (GDP) to the NATO military alliance also falls victim to Chalmers’ withering inquiry. Going forward, Chalmers recommends a return to an older set of defense and foreign policy principles. “The grand strategy which [the UK] adopted in the 1940s, anchored on a community of fate between the countries of Europe and North America, remains the right one for the country today,” he argues. The strategic reorientation known as the Pivot to Asia, discussion of which was much in vogue in foreign policy circles before the ISIS and Ukraine crises loomed, is still the most pressing issue, according to Chalmers. “No relationship is more important to the future of international peace and security than the one between the US and China. However, Chalmers suggests that far from large-scale military involvement, the best course for Britain at the moment is to maintain existing levels of military exchange with regional allies like Australia and New Zealand, while strengthening diplomatic linkages. It is over to the victors after May 7 to heed or reject this prognosis.